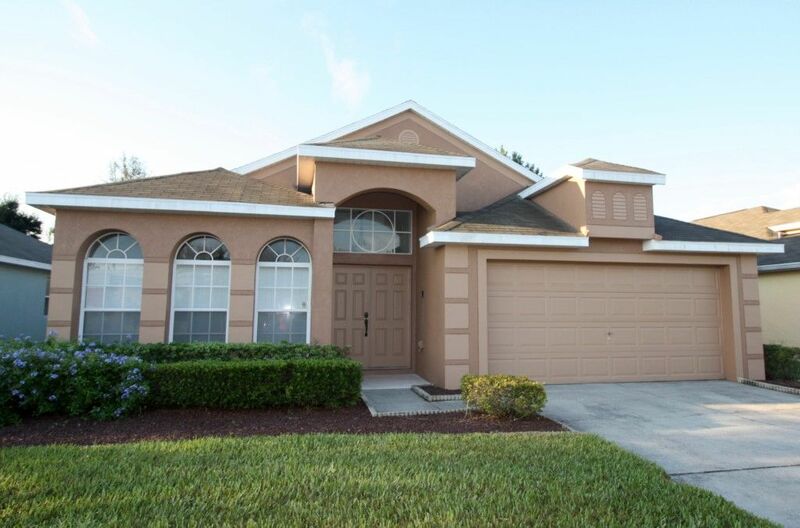 Détendez-vous et profitez de votre séjour en Floride dans ce décorées avec goût villa de 4 chambres dans la Communauté Gated de Mission Park dans la région de Four Corners. La maison dispose d'un plan d'étage ouvert avec une grande cuisine, Salle familiale, Salon et un Sud face à la piscine privée avec Spa et sur-dimensionnés Pool Deck. Le Lanai couvert a une table et des chaises ainsi qu'un barbecue / Grill, fourni gratuitement, parfait pour le coucher du soleil à manger. La chambre principale a un lit king size et une grande salle de bains en-suite. En outre, la maison dispose de deux chambres à coucher queen, une chambre à deux lits et une salle de bains Hall. Toutes les chambres sont équipées de ventilateurs écran plat de télévision par câble et plafond. Pour aider à vous détendre après une longue journée dans les parcs se rafraîchir dans la piscine, regarder un film ou jouer à un jeu. Il y a un lecteur de DVD et une console Nintendo Wii avec certains jeux. Apportez votre jeu préféré Nintendo et DVD ou simplement louer un film à un endroit RedBox, à quelques minutes. WIFI gratuit et appels téléphoniques aux États-Unis et au Canada et à Porto Rico. Un coffre-fort mural est fourni pour stocker tous les objets de valeur. Voyager avec des petits enfants, nous vous avons couvert. La maison a un Pack 'n' Play, chaise haute et poussette. A quelques pas de la maison est la piscine communautaire et aire de jeux avec une zone d'escalade Cour de basket-ball et de l'enfance avec un diaporama. Great stay, especially for families! We just returned from five days here and had a great stay! The house was great space for us and our grandkids. We loved the pool and the nearby play ground. It was helpful to have the high chair, stroller and pack and play in the house. It was a good location to Disney World and had plenty of stores and restaurants within 20 minutes. The house was clean and ready for us. Pamela and Willie were great to deal with. The only bad thing was having to leave! Thanks for your feedback, we are pleased that you thought the house was nice and clean and that the pool was great. We are glad you were able to enjoy the pool even though the spa was not heated. As stated when you contacted me about this, the reason the pool & spa was not heated was because you did not indicate you wanted pool/spa heat. We have a guest directory where we provide a wealth of information about the home and surrounding area. We checked the home and can confirm that we do not have signs in every room telling guests what to do and telling them what the additional cost would be. However, we feel it is important that guests are aware of parking rules in the community in order for their cars not be towed at night and if they do not comply what the cost would be. It’s also important for guests to know how the Air Conditioning works and how to prevent the unit from freezing up. Furthermore, as our industry is regulated by the State certain Licenses and Public Notices have to be prominently displayed. We look after 26 vacation homes and have the same number of signs in all of the homes we manage and have never received any negative comments from our guests, to the contrary, guests made positive comments as they appreciated the information provided. We had a great stay in Florida at the house in Mission Park. Our favourite part of the house was the pool, which is larger than some we have stayed at. The bed was comfortable and the living room furniture was comfortable. The house was very clean except the doors ( particularly the master bathroom door) needed a good scrub down. We really appreciated the hand soap in each bathroom and the small bottle of dish soap in the kitchen. We did a lot of our own cooking and a couple more leftover containers would be useful. Other than that we had everything we needed to make our own meals. We did use the provided bicycles which was fun but we had to do some work on the white one as it seems the seat stem is not the right size and it kept sliding down to lowest height. Overall we really liked the house and would not hesitate to stay here again. The property was beautiful. It was even more than I expected. Loved it! My stay at the property was a great experience. Everything that was offered and more was on the property. I would stay there again and recommend this property. There were a few minor things, nothing that would change my opinion of the property, The hot tub didn't get hot and the operation of the television was a bit confusing. The property has everything you should need except food. But there are stores in very close proximity. The neighborhood was nice as well. Thanks for your feedback, we are so pleased that you enjoyed your stay in our home and that the property exceeded your expectations. Regarding the hot tub, the reason it did not get hot is because you did not request pool and spa heat. In our Terms and Conditions it states that if you would like pool and spa heat there is an additional charge. As you did not advise us that you wanted to pay the additional charge to have the pool and spa heated, it was not turned on. Thanks again for your comments, we truly appreciated them. We look forward to welcoming you again. We a family of five, have just left the villa. We had a wonderful holiday and the villa made the stay. This villa is very well equipped. We loved the large south facing pool area and we loved the use of a gas grill on the warm evenings. It's not to far from the main attractions and supermarkets are close by. There is table football and table tennis in the garage, along with dominoes to keep you occupied if the heavens open. The management company are very efficient, there was an issue with the pool one day(dry pump)and after a phone call Willy attended within 15 minutes. We would like to thank Pamela and Willy for our stay.